Having moved at "super speed", much faster than a normal cyclone would, it has crossed the coast south of Mumbai, and now, at 5p.m. is at 19N and 73E. Core pressure is 989 mb and winds at 40 knts. That is East of Mumbai. The rainfall concentration is now to the East of Mumbai. Mumbai: Rather than a hindrance, the rains were welcome in Mumbai, and surely to the lakes supplying water. A few heavy showers could still be expected in evening, tapering off late in the night. Rains to some extent, maybe light, till tomorrow afternoon at the most. Ketti, in the Nilgiris, near Ooty, had an unusually heavy rainfall of 82 cms in the 24 hrs. ended Tuesday morning. Coonoor had a super 35 cms for 2 consecutive days on Monday and Tuesday, while Ooty recorded 18 cms. And a low temperature of 5c ! Kodaikanal recieved 15 cms also on 2 consecutive days from Monday. Wow ! No wonder the massive landslides there ! 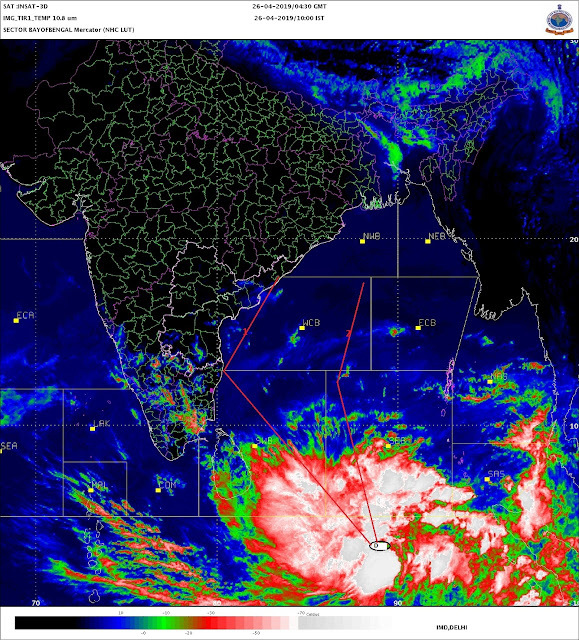 How come this Phyan did not cause heavy rains nor heavy winds in Mumbai although it went just 20 kms south of Mumbai? It does not appear to have caused any damage in Ratnagiri, Raigad districts as well. Looks like Phyan went phisss.. Most surprising. Only reason I see is yes, it was disintegrating very very fast. In the morning we were not sure of its course and where it will cross. And by 2 pm it had crossed the coast. From 982 mb, it slid to 993 mb in 4 hrs only. phyan needs a detailed analysis. looked like an unseen force puncturing the cyclone and shoving it across the coast. probably the only cyclone is history to cross so mildly without anyone believing it has crossed. or is it the western ghats that killed it. Why are rains forecasted by weather sites for Mumbai over the next couple of days? What is happening now? The cyclone is dead and gone. maybe some residual moisture, as mentioned in my blog today. But not too sure.